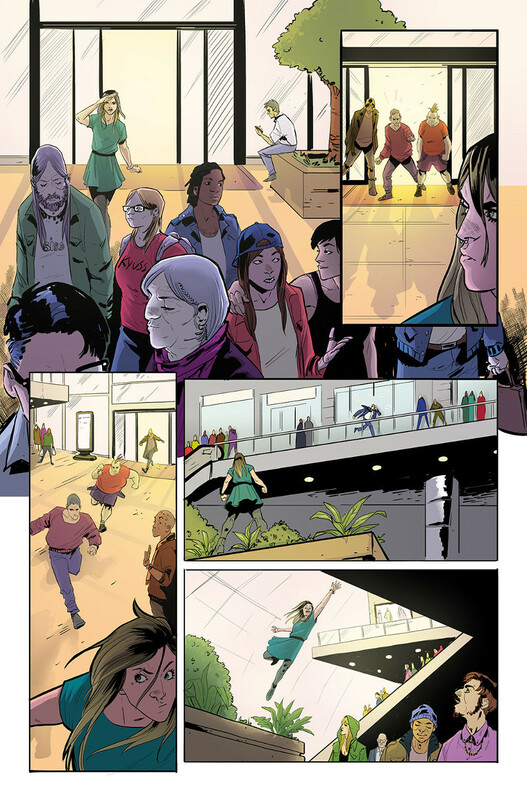 What happens when you’re creating a new, hot comic and everything changes in an instant? What do you do when your co-creator and artist steps back from your project and it gets expanded from a mini-series to an ongoing? While one could easily file a lot of that under the category of “good problems to have,” it’s still a problem, and a fascinating one that Chris Sebela and Jonathan Brandon Sawyer’s We(l)come Back from Boom! Studios faced after its second issue. Also, it’s one I was able to speak with both Sebela and new series artist Claire Roe about, thanks to the team at Boom! As an unabashed fan of Sawyer’s work, it was sad to hear Sawyer was moving from interiors and covers to only covers going forward, and Sebela talks about how the project changes after Sawyer’s departure and the book expanding its scope at the same time. Also, Roe talks about her nerves jumping into her first ongoing series and what pressure it puts on her to follow in someone else’s footsteps. It’s a great chat with two talented creators who are retooling on the fly, and one that provides insight into what happens when a comic needs to change in an unexpected way. Give it a read, and if you haven’t read We(l)come Back yet, it definitely earns a SKTCHD recommendation. It’s a unique and exciting book from some highly gifted folks. Chris, you’ve had a big month. First off, you’re not living in a clown motel anymore. Congratulations. Second off, your new creator-owned book at Boom! – We(l)come Back – has expanded to be an ongoing series. How does that impact your plans for the book? Sebela: Thanks. Both of those facts make me very happy in very different ways. I always had plans for We(l)come Back to be a much longer story than 4 issues. Just the story of Mali and Tessa — which is our main focus — was originally envisioned to be 12 issues in my head, but I felt like it always had legs to be much bigger. The more I’ve worked on it, the more it sort of expanded, with each new Sequel that shows up, I’d get momentarily lost thinking about how they got there, what their past lives were like, what sort of hijinx they must get into in their own lives of hunting down Targets or being assistants to other peoples’ deaths, so it’s become an infinite fractal of issues in my head by now, stretching into forever and ever. 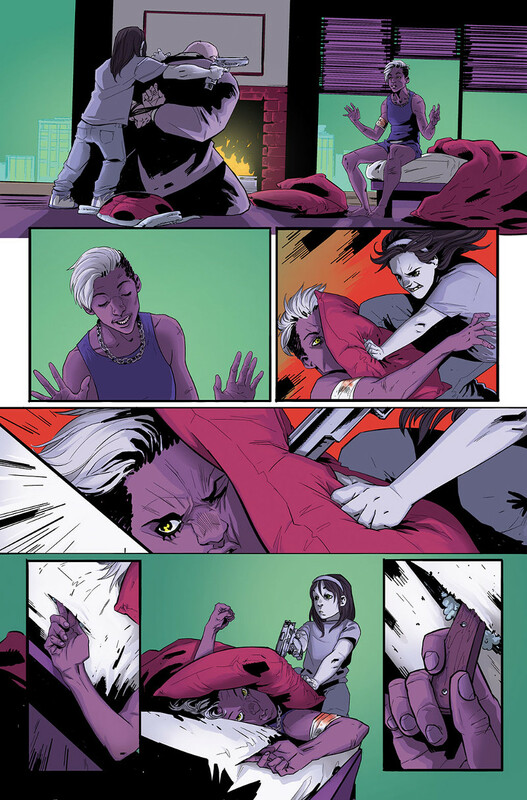 With that change comes news that artist and co-creator Jonathan Brandon Sawyer won’t be providing interiors anymore, only covers, with Claire Roe taking over as the artist. What led to that change, and is it the case on an ongoing for the foreseeable future? Sebela: Ultimately it came down to schedule stuff. Any book — especially a brand new book from a quasi-unknown team that doesn’t have established superheroes — is subject to a lot of expectations from fans and retailers: both of whom only have a budgeted amount they’re planning on spending. Coming out on a regular schedule is top of the wish list. If gaps start showing up in your schedule, it can make people nervous or forgetful when your next issue comes out, your order numbers can drop precipitously and that just grows and grows as you go. With Jonathan, he’s amazing and he had a lot on his plate going on besides We(l)come Back and it was either he do a book he wasn’t as proud of in the monthly grind or take his time and make every page and every panel count. Jonathan didn’t want to turn out stuff he wasn’t happy with and if you look at Jonathan’s stuff, it’s tremendously great work and it’s because he puts his heart and soul into every panel, and I definitely didn’t want him to sacrifice any of that. Comics is hard, you pour a lot of time and your life into it and it gets to a point where you have to pick your battles. Jonathan and I have talked about him possibly coming back for an issue or two down the road. The door is open. 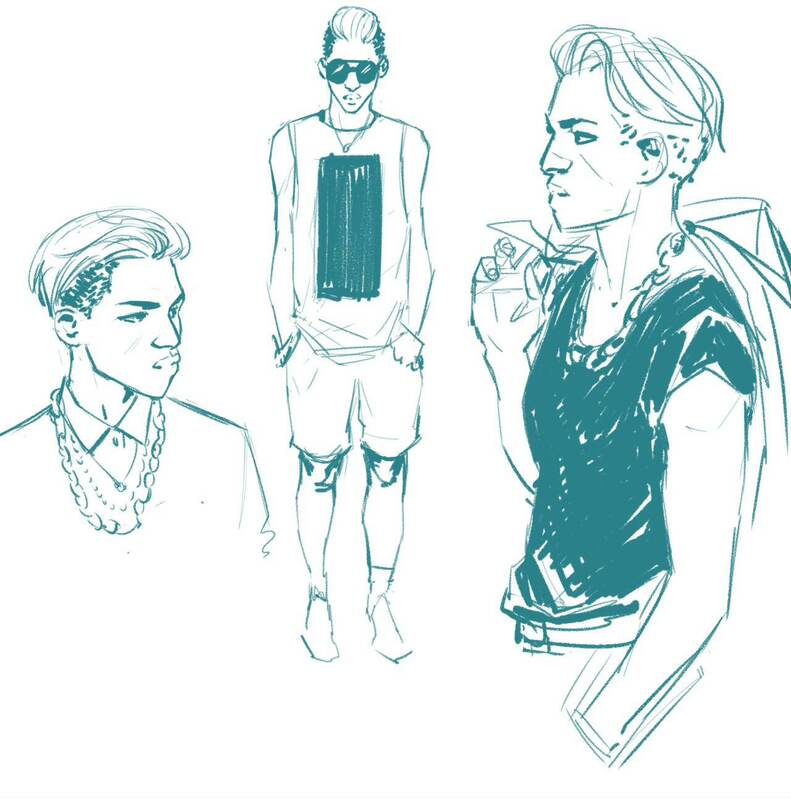 But right now he’s working on a new creator-owned project that I’m really excited about and he’s still my co-creator on this book — We(l)come Back wouldn’t be what it is without Jonathan’s ideas and the way he built this world and these characters. He’s also my friend and I love working with him and hopefully, if it all works out the way we hope, we’ll work on something else together not too far down the road. 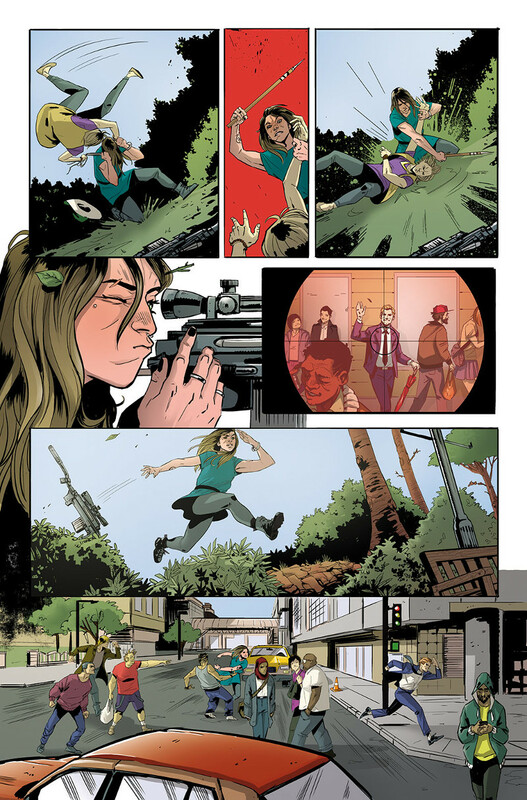 We’re already familiar with Claire’s work, as she subbed in for the last four pages of issue #2. What makes her an ideal fit for the book with Sawyer stepping back? Sebela: Claire’s stuff is really detailed and kinetic, like Jonathan, but completely operating in her own style. One thing I really look for in collaborators is good acting. Being able to choreograph fights and properly showing what it looks like when a dude is getting kicked in the jaw is good too, but if I can be sold on a moment solely by the look on a character’s face, it’s massively important. Claire does great expressions and body language. Kill faces, confused faces, sadness, happiness, terror, exhaustion, she can handle whatever winds up in my scripts and sell it as authentic and human as easily as she does the completely bananas stuff. Claire, what appealed to you about We(l)come Back as a project, and what made you want to come onboard once the opportunity arose? Roe: I got a short paragraph summary about the project from an editor asking if I would be interested, and even from that, the story sounded really cool. The world that Chris and Jonathan have built is epic; eternal warriors through time doomed to repeat the violent cycle, its an awesome concept! The thing that sold it to me though was the leading women- I couldn’t have asked for a better cast. As comics fan, that’s always something that peaks my interest on a series. 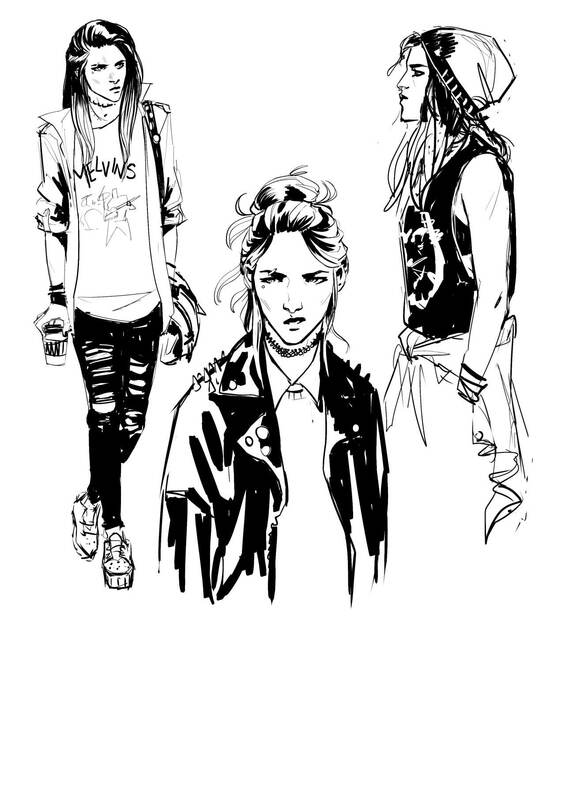 And I mean c’mon, I get to draw a cool chick with an undercut. For you as a writer, Chris – especially on a book co-created with your artist – how does this change things for you? Are you needing to start from scratch on the process of the book, and are you opening things up for Claire to really input into the future of the book as well? Sebela: It does change things and it doesn’t. Unless it’s something massively important to what I’m trying to get across, I don’t get into precise angles or every little exacting detail. I like to leave things open as much as I can and as much as the artist wants so no one has to open a script from me and sigh dejectedly. They’re free to take things in directions that make sense to them and when it all comes together, it comes together as something completely new. So I’m not starting from scratch, but I am adjusting to working with Claire because it’s different from working with any other artist. You talk, you figure out what the other person likes, what they don’t. You tweak from there so you and everyone else is happy and fulfilled working on this book together. Coming in on a creator-owned book after it has already launched and the artist has to take a step back has to be a tough situation, especially given that you had to finish the second issue, Claire. For you, was it a tough adjustment at all, and how did Chris and the rest of the creative team help make it a smooth transition? Roe: Yeah it was really hard, I was thrown into the deep end. After I had been asked to work on the title I started straight away, on the third issue and those pages in the second. Jonathan’s art is so great- finishing that issue was nerve wracking. Knowing people already have expectations of the series from the previous artwork is stressful, but I try not to think of that. The biggest challenge was definitely the fact that I came in a total stranger. Every artist will have different interpretations of a script, so I hope all the information I’ve taken in from the first issues is filtered down into work that still holds true to what the WCB team intended for the series. But the editors are fantastic, and Chris is just a message away on twitter, so it’s great knowing I have the world-builder right there if I have any questions. Though the scripts are so well written that all the information I need is there. What kind of challenges have come up in needing to retool on the fly, Chris, and what advantages do you feel it brings to the book as well? Sebela: I didn’t even expect the book to get more than 4 issues, being a cautious pessimist at the best of times, so I’d managed to rework the first arc to at least hit some of the stuff I’d imagined more spread out initially. Which leaves me in a weird spot where I’ve made a lot of choices for the first arc that I really like and I think benefit the book as a whole, but I also burned a big hole in my map, so I have to rethink lots of stuff, which is kind of fun for someone who largely works from obsessive outlines. Without that net, it keeps me reaching a little further for something better than I did before. A lot of thinking on this book has been made very spur of the moment and it’s worked out well for us, so I’m excited about having a hazy premonition of what’s to come but not knowing exactly what’s around every corner. Given the different strengths each artist might have, do you find yourself writing differently at all for Claire’s talents than for Sawyer’s? Or is it pretty much business as usual for you? Sebela: When Claire’s name was brought up I went back and pored over her comic Saltire and that helped me figure out what she liked to do when she was working on something completely her own. It definitely shaped the next script I wrote, keeping her preferences and choices in mind, but I didn’t have to reinvent the wheel. I think there’s enough spots where Claire and Jonathan’s styles overlap that it’s been more of a nudge than a sledgehammer. Claire, you and Jonathan have different styles, through and through. That’s not a problem by any means, but given that he established the artistic voice of the series with the first issue and three quarters, did you feel the need to match your art to his at all, or are you just focusing on telling the best story you can? 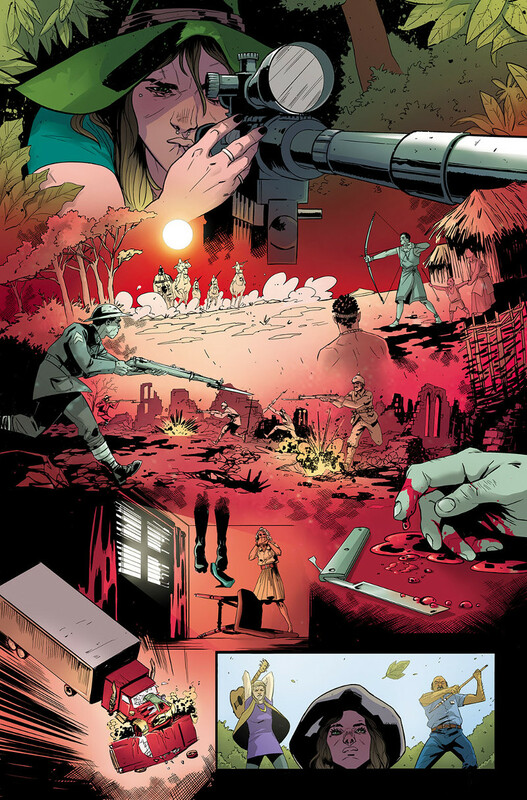 Roe: I have poured over Jonathan’s art in the first two issues, to soak up the details, get a feel for the world and characters. But no, I never felt the need to try imitate his art … I don’t think I would be able to. The editors saw my work and liked it, so I trust they chose me for my own style. I believe this is your first ongoing series, Claire. How are you feeling? Excited? Nervous? Somewhere in-between? For readers who might have been onboard initially for Sawyer’s art, what can you tell them? What does the future of We(l)come Back look like with him stepping back from interiors? Sebela: I think the future looks good. I know there’s nervousness when art duties change, and I was nervous too. And I’m clearly biased, but I think if you loved Jonathan’s issues, you’ll love Claire’s issues. I do, at least, which is hard. When I got the lettering proof for We(l)come Back #3, I sat down intending to read it over and start making notes about where I’d screwed up: phrasings or word choices or bolding. Instead, I just read it and had a genuinely good time reading my own book, which is rare. You get so close to this stuff in the process that all you can see are the messed up trees and not the majestic forest. Claire’s art just blew me away and carried me through the whole thing. That’s the best thing I can think to say about it is that it’s the same way I felt when I’d get proofs of Jonathan’s pages. They’re both such talented storytellers that I was always able to let go of my neuroses for a short while and just enjoy this thing we made together. Roe’s first full issue of We(l)come Back is #3, and it drops on November 18th. Look for that in your local comic book shop or digital retailer.